In what’s either the final gasp of CandyAssGate—or just another, slightly sneakier front in an ongoing war—Vin Diesel has opened up about the tensions between himself and Dwayne Johnson on the set of The Fate Of The Furious. According to a recent Entertainment Weekly interview, Diesel has said that the arguments between the two actors have been overblown, and that he and Johnson are much closer than people think. “In my house, he’s Uncle Dwayne,” Diesel noted, in what’s actually a pretty sweet thing to hear. It’s not clear what, exactly, the superheroic Diesel is protecting Johnson from. Wolves? Bad news? Scott Eastwood? Either way, “He appreciates it. 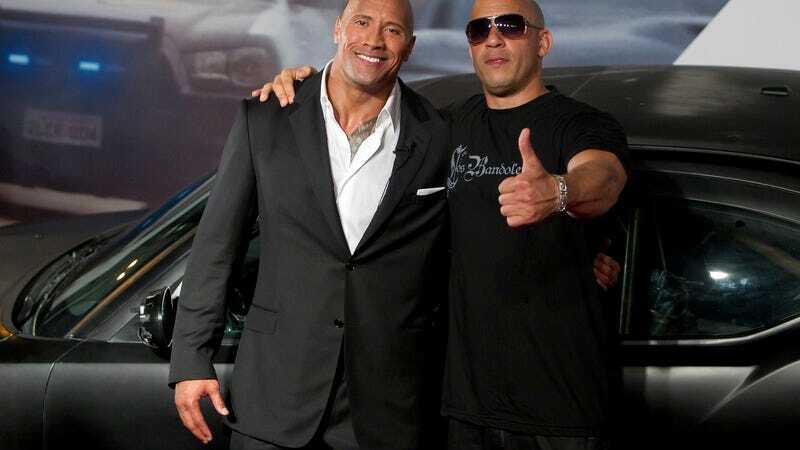 Dwayne has only got one Vin in his life. Dwayne Johnson only has one big brother in this film world and that’s me.” Again, sweet, even if positing Johnson—currently the world’s most successful action star—as the “little brother” in their relationship doesn’t quite ring true. Diesel then concluded, “I’m always rooting for Dwayne. I’m the first multicultural megastar in Hollywood. They didn’t exist. To see another multicultural star come up is something I am very proud of.” Which kind of sounds like he’s taking partial credit for Johnson’s success, which is exactly the sort of thing that’s certain to put this thing to rest before it can generate even more buzz for The Fate Of The Furious ahead of its arrival in theaters next Friday.